It's time to share with you about my last week, it was time out in the afternoon for me after fetching my kids from school. Yeah out with my blogger friends, they are Kathy and Sebrinah for the right bra at Neubodi, Kota Damansara, for your info that outlet is the only one that is located at the shop lot. Discover Neubodi : A Passionate Profession: They sell more than undergarments at Neubodi . Their hand-sewn lingerie consists of over 600 sizes, colours and designs, available up to l Cup. "Every Woman Deserves the Right Bra" conveys the philosophy and passion behind the creation of the Neubodi brand. To us, design starts with the desire to allow every woman to afford a beautiful, high quality without having to compromise for fit. We devote 100% to ensure our collections are made from high quality materials and superior craftsmanship. This is why every piece of Neubodi bra requires a far greater proportion of manual work - from crafting, cutting, stitching, testing to fitting, each bra goes through at least 45 stages of assembly work with over 60 different parts of material to create the impeccable fit. " 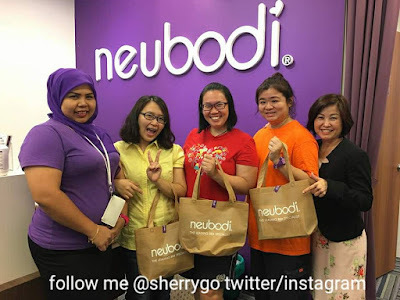 - Anne Tan, Managing Director & Founder of Neubodi. Being mom of two boys I am always on the go, yeah in and out of the house to fetch my boys. Before photos are the bra I am wearing from home, the after photos are bra I wear at Neubodi. It's comfortable and suitable for me too. I tried a few styles and different cups too, glad to find the match one for my breasts. Looking at the above chart it is show you the Right Way to put on a bra. Wear the straps. Lean forward slightly so that your breasts fall nicely into the cups. Fastern the hooks of your bra. Adjust the straps of a level that you feel comfortable. Bend body forward. 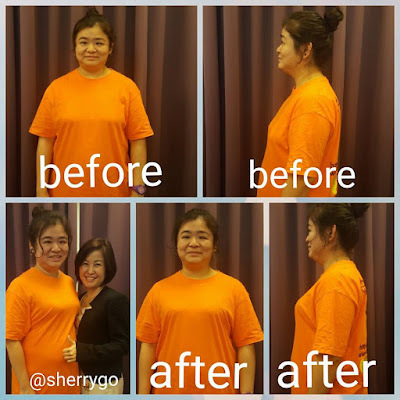 Slip a hand into the back of the bra and sweep the fatty tissues to the front, and back into the bra cup. Stand straight. Slip your hand again into the cup and lift the breasts while holding the wire in the correct position with the other hand. Ensure that the bra snugs horizontally around your body. Nursing moms can also find their suitable bras at Neubodi, they have wide range of bras to choose from. The staffs are friendly and will assist you to find the suitable for you. All Neubodi stores provide a pleasant, inviting ambience and they hav bra-fitting professionals to assist. They provide a warm personalized fitting solution that includes choosing and sharing the methods of wearing a right-fitted bra. You can let them know of your personal preferences and expectations, they would identify the height, build and posture, hence using a unique hand measuring technique to help you find the right bra is best suited to your shape. Thanks to GM for assist me and I am happy to find the right fit bra for myself. It's not just about purchasing the right bra but also lingerie care that we need to know. You can find there sell the delicate detergent that can use to wash the lingerie. Always hook the back of your bra to prevent any damage to the lace and fabric. Scrub the underband and bra straps gently with your hands, do not use any brush to brush the bra. Fold your hands into a fist and gently press the excess water out of the cups, do not squeeze the cups. Hang your bras upside down to dry. Always remember do not dry under direct sunlight. Do not tumble dry. 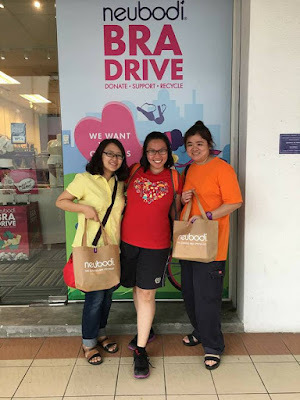 I done a blog post of Neubodi -Donate, Support, Recycle Bra Campaign, you can click on the link to view it. 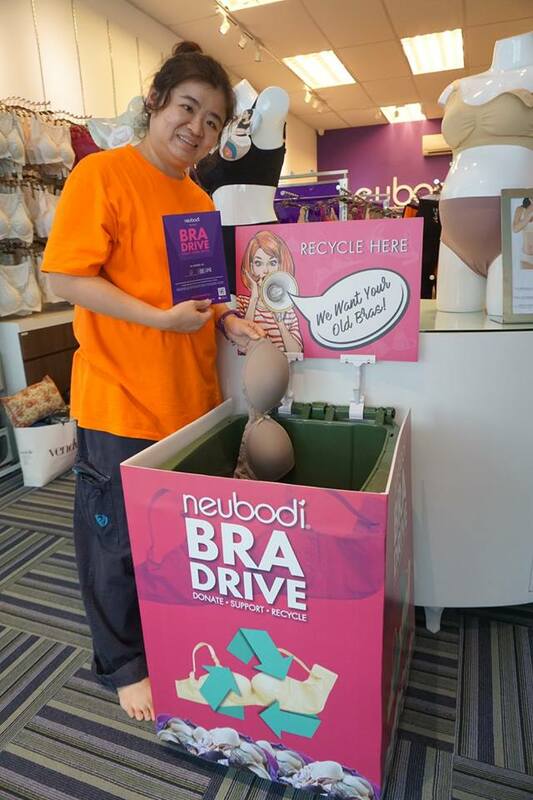 Don't forget to bring along your old bra to donate at Neubodi any stores. All Neubodi collections are hand cut and hand sewn. We undertake extensive research and design efforts to implement a three dimensions (3D) way of sculpting, cutting and hand-tailoring every piece to meet the demands of different women with vary breasts size and body shape. I am happy be among the women that have found the right bra, thanks to the bra specialist at the outlet. We could purchase RM200 dress but we are not wearing it daily, we need to wear bra daily. Investing on suitable and selecting right size, cup and style that fits matters. Christmas is coming soon, you can bring your wife or your mom to the stores to shop for Neubodi it's a nice gift for loved ones. Neubodi was awarded with the Asia Pacific Top Excellence Brand award in May 2011 -- marking a testament being a distinguished label for everyday comfort. It looks like a great shop for a good bras. Nowadays, It's hard to find a perfect fitted bra for us. and I think this is the best shop for the ladies. Im a plastic surgeon and very often I see people having no clue as to how to choose the undergarments. they have no idea about the cup sizes etc. Guess these specialists will help. I would love to participate in the bra drive but it is too far away from me. Hope to have the chance to try Neubodi one day. Oh wow, now I can get better fitting bras for myself! oh wait.. The most concerning clothing for me is the bra!!! Yes, finding a suitable bra is very important. I love wearing their bra! Makes me feels really comfortable and a straight body too.